1. Restoring to health; promoting the closure of wounds and ulcers. 2. The process of a return to health. 3. Closing of a wound. /heal·ing/ (hēl´ing) a process of cure; the restoration of integrity to injured tissue. healing by first intention that in which union or restoration of continuity occurs directly without intervention of granulations. healing by second intention union by closure of a wound with granulations. spiritual healing the use of spiritual practices, such as prayer, for the purpose of effecting a cure of or an improvement in an illness. healing by third intention treatment of a grossly contaminated wound by delaying closure until after contamination has been markedly reduced and inflammation has subsided. the act or process in which the normal structural and functional characteristics of health are restored to diseased, dysfunctional, or damaged tissues, organs, or systems of the body. See also intention, wound repair. The restoration to a normal mental or physical condition, esp. of an inflammation or a wound. 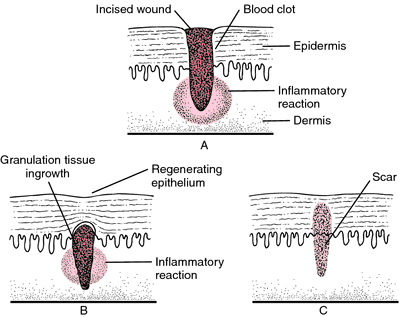 Tissue healing usually occurs in predictable stages: formation of blood clots at the wound; inflammatory phase, during which plasma proteins enter the injured part; cellular repair, with an influx of fibroblasts and mesenchymal cells; regrowth of blood vessels (angiogenesis); and synthesis and revision of collagen fibers (scar formation). These may result from the formation of a scar that interferes with the functioning of a part and possible deformity; the formation of a keloid, the result of overgrowth of connective tissue forming a tumor in the surface of a scar; necrosis of the skin and mucous membrane that produces a raw surface, which results in an ulcer; a sinus or fistula, which may be due to bacteria or some foreign substance remaining in the wound; proud flesh, which represents excessive growth of granulation tissue. 2. Health practices of native or indigenous peoples within a geographic region, which often include folk and spiritual elements. In Canada, the term pertains to specific governmental efforts to address health issues of indigenous or First Nations peoples. Healing from illness attributed to the agency of a divine being or power, usually through a variety of spiritual practices such as prayer, laying on of hands, or anointing with oil. A process that closes the edge of a wound with little or no inflammatory reaction and in such a manner that little or no scar is left to reveal the site of the injury. New cells are formed to take the place of dead ones, and the capillary walls stretch across the wound to join themselves to each other in a smooth surface. New connective tissue may form an almost imperceptible but temporary scar. In repairing lacerations and surgical wounds, the goal is to produce a repaired area that will heal by first intention. Healing by granulation or indirect union. Granulation tissue is formed to fill the gap between the edges of the wound with a thin layer of fibrinous exudate. 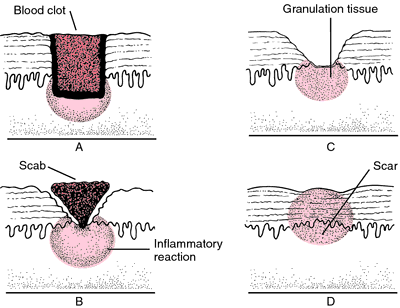 Granulation tissue also excludes bacteria from the wound and brings new blood vessels to the injured part. 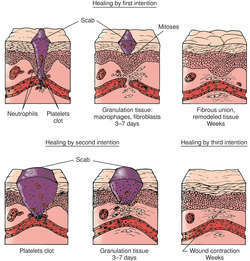 Healing by second intention takes longer than healing by primary intention and typically results in the formation of a prominent scar; wounds that heal by second intention show signs of failure if the wound loses the normal red-gray appearance of granulation tissue and becomes pale, dry, or insubstantial. When granulations first form at the top instead of the bottom of the wound, the base of the wound may have to be kept open with wicks or drains to promote healthy tissue repair. Delayed wound healing that occurs in the base of ulcerated or cavitary wounds, esp. those that have become infected. The wound fills very slowly with granulation tissue and often forms a large scar. Wound revision surgery, including use of grafting, may be needed. 1. The natural processes of tissue repair or restoration following an injury. 2. A power often wrongly attributed to doctors. Healing is a homeostatic function of the body and occurs automatically unless prevented by infection, continuing injury of any kind, radiation, cancerous change, the presence of foreign material or great age. 3. A claimed paranormal ability to perform miracles. n 1. the process of recovery, repair, and restoration. n in naturopathic medicine, a healing reaction. Symptoms of bodic defense are observable and successful. n program developed by the Department of Cardiac Rehabilitation at Union Hospital in Lynn, Massachusetts to aid recovery of cardiac patients by incorporating meditation, guided imagery, facilitated group meetings, and yoga along with traditional therapies. n method that employs gems to alter the body's energy to treat certain mental and physical conditions. n healing via a hypothesized form of consciousness that apparently works without recourse to any physical medium or energies. n faith-based proces-ses that restore the psychologic, physical, social, and spiritual aspects of a patient. n the use of gentle techniques aimed at rebalancing either the patient's energy or the energy flow between patient and practitioner. n mental techniques and processes that restore the psychologic, physical, social, and spiritual aspects of a patient. n any healing that cannot be accountd for (or one for which the odds against are very high) through medical or psychosomatic means. n processes which cannot be explained scientifically that restore the psychologic, physical, social, and spiritual aspects of a patient. n mental or psychic processes that restore the psychologic, physical, social, and spiritual aspects of a patient. n the notion that the body is capable of healing itself, regularly evidenced through the placebo effect. A highly regarded tenet of most alternative healing practices. n system of faith or belief, that involves healing through meditation, prayer, or touch, in which the healer serves as a channel through which spiritual energy flows to the client. n healing effected through nonmaterial or miraculous means. See also healing, miracle and supernatural mechanism. n practice in which the healer, through a meditative state of consciousness sees himself as completely unified with the patient. The healer does not try to consciously heal the patient but seeks to experience love, oneness, and unity with the person. n practice in which the healer physically touches the patient with the intent to heal, and transmits his energy to the patient. n the antural process of repair in damaged tissues, comprising the inflammation response, the creation of a fibrin framework upon which the scab develops, the defensive action of white blood cells, the epithelial closure of the wound with myofibroblasts, and the creation of a scar. the restoration of structure and function of injured or diseased tissues. The healing processes include blood clotting, tissue mending, scarring and bone healing. See also wound healing. per primam; union of accurately coapted edges of a wound, with an irreducible minimum of granulation tissue. per secundam; union by adhesion of granulating surfaces. per tertiam; union of a wound that is closed surgically several days after the injury. See also delayed primary closure. I have also noticed a substantial increase in the number of colleges or other educational bodies offering different courses in natural and other holistic healing therapies which is great. When the "drug" fails him, Sam decides to entertain the thought of holistic healing. In chapters five through seven, Pike weaves interrelated themes of healing as a means to usher in the New Age, leading to its climax in a changed status between men and women, healthy diet, holistic healing practices, and world peace. This focus is particularly evident in critical care units, where the technology, work flow, and unit design emphasize standard interventions aimed at the eradication of disease, often at the expense of more individualized and holistic healing practices. Prince Albert Grand Council Holistic Healing and Talking Circle Facilitator, Shell Lake. In this handbook the reader will be presented with the history and science of the holistic healing process. Lesbians have played a leading role in bringing holistic healing methods into the mainstream," says Kathleen DeBold, executive director of the Mautner Project in Washington, D.
There are volunteer programs, holistic healing courses, and mentoring classes for horse owners and handlers. Illouz's point is that we live in a culture fascinated with the pain of others; the victimization du jour of Winfrey's show is popular because it assumes that there is virtue in suffering that leads to holistic healing. 17, one of the tall buildings whose "shorter sides" face the Hareidi neighborhood of Shaarei Hessed, dozens of women can be seen entering the offices of the Shachar Institute, where courses are offered in reflexology, holistic healing - and Scientology. Truly holistic healing offers us a way of thinking that can help heal the planet, looking at not just the body-mind-spirit connection, but also the very situation in which we live.